Laura Behnke has more from Lower Manhattan. 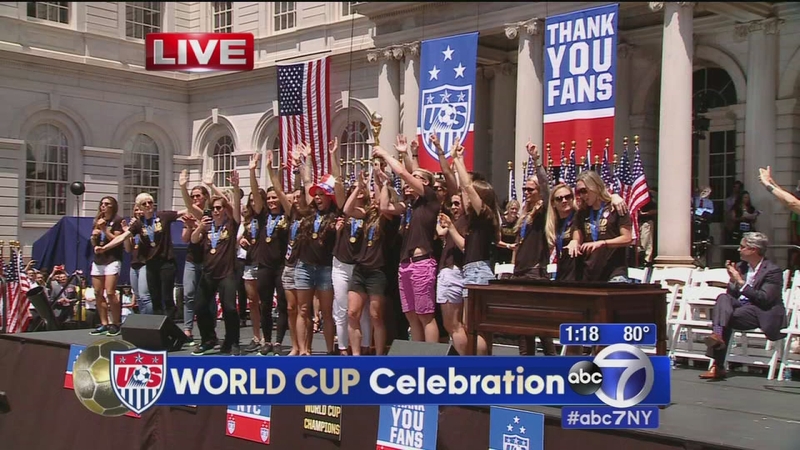 NEW YORK -- The U.S. women's soccer team got a hero's welcome at City Hall in New York City following a parade along the Canyon of Heroes. The ceremony followed a parade in lower Manhattan that drew throngs of flag-waving fans. On Friday morning, the World Cup champion U.S. women's soccer team will make their way up the Canyon of Heroes, along Broadway from the Battery to City Hall, beginning at 11 a.m. 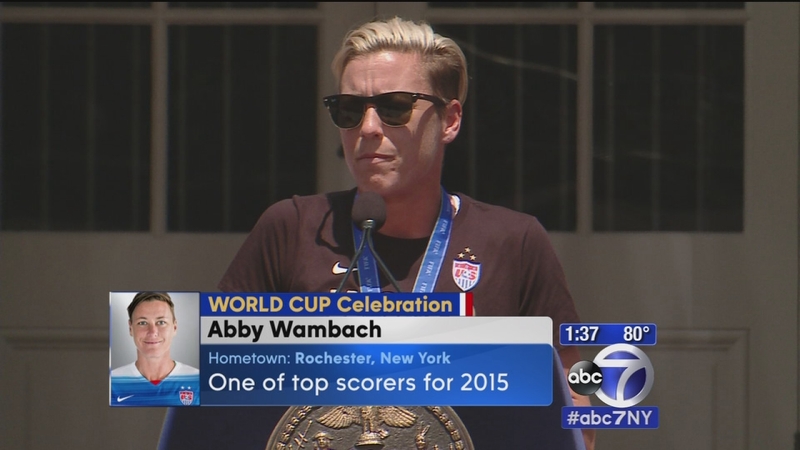 The celebration was hosted by broadcaster Robin Roberts and former soccer star Heather Mitts. At its conclusion, the team will be honored by de Blasio in front of a crowd of 3,500 people at City Hall Plaza. 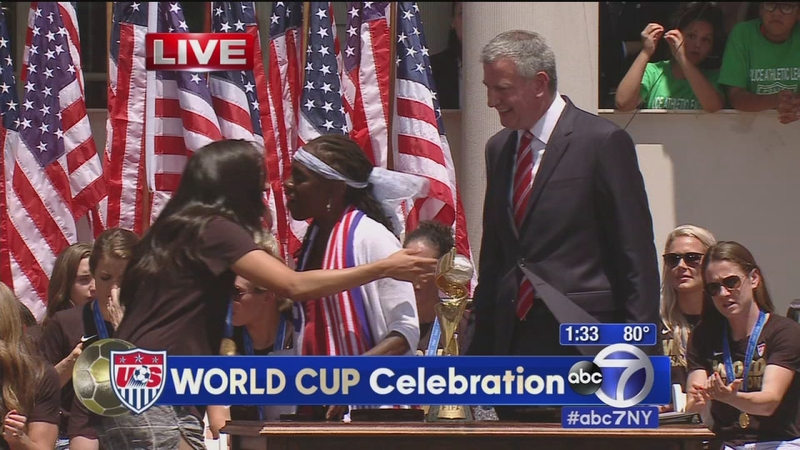 De Blasio will present members of the United States Women's National Soccer Team with keys to the city. The parade made its way up the Canyon of Heroes, along Broadway from the Battery to City Hall. 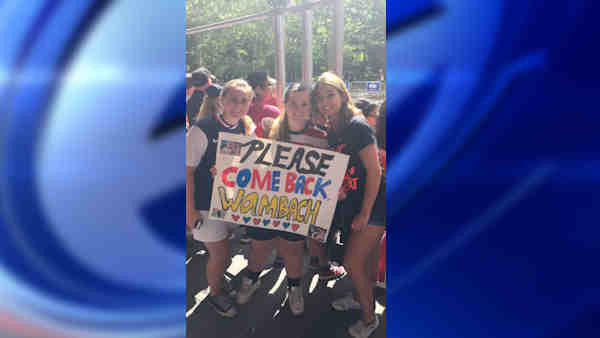 Abby Wambach thanks fans for their support. "They played like a team ... What an extraordinary season." Mayor also lauds the team in Spanish, and calls them "an inspiration to women all over the world"
Christy Rampone brings out the Cup. A 4th floor window on a building near the route was decorated with a homemade sign that reads "Girl Power" with four American flags. 1 p.m. What does it look like from the parade route? How does it feel to be along the parade route? Nina Pineda has a look. 12:24 p.m. Think your place is a mess? Well, it's all relative. New York City's Department of Sanitation has assigned more than 400 workers to remove the debris after Friday's World Cup Soccer parade in Lower Manhattan. They'll be containing tons and tons of debris with the help of 14 collection trucks, 10 front-end loaders, 100 backpack blowers and 66 rakes. Other "assorted cleaning equipment" includes brooms - 30 mechanical, 80 old-school. City officials say the goal is to recycle as much of the confetti as possible. 12:14 p.m. FAN! FAN! FANS! 12:08 "We love you, New York!" Amy Freeze has more from along the parade route. 11 a.m. Here we go! The parade is starting! 10:40 a.m. Crowd is READY! The parade-goers started gathering at 3:30 a.m. Friday along the Canyon of Heroes, a stretch of Broadway where the nation's largest city has honored its legends. Two hours before the 11 a.m. start, the crowd already was three to four deep along the route. One of the floats will carry the tournament's most valuable player, Carli Lloyd, along with other players and Mayor Bill de Blasio. The ticker-tape parade will be followed by a ceremony at City Hall. 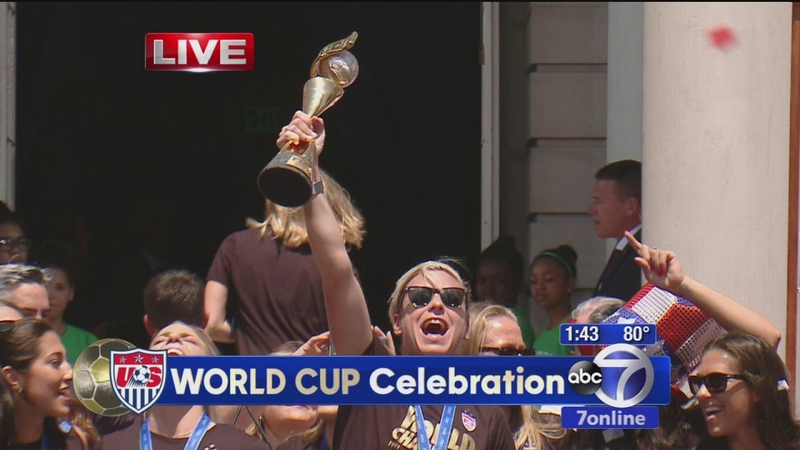 Girls who play soccer are being treated to a watch party overlooking the Women's World Cup parade route in Lower Manhattan. Manhattan Borough President Gale Brewer is hosting the gathering at the United Federation of Teachers' offices. UFT President Michael Mulgrew says the U.S. women's soccer team exhibits a great work ethic and competitive spirit that can inspire student athletes - especially the girls. The girls attending the party are from youth soccer programs across Manhattan. 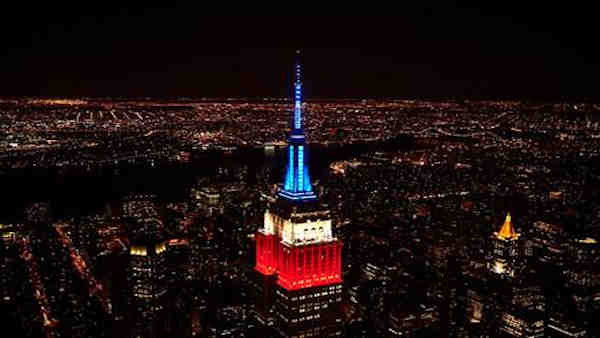 The Empire State Building will shine red, white and blue on Friday to celebrate the Women's World Cup Champion U.S. Women's National Team. Governor Cuomo today announced that the lights on One World Trade Center's 408-foot spire will light up red, white and blue on Friday night to honor the U.S. Women's national soccer team. 7:45 a.m. Biggest flag EVER! Officials say they're planning to unfurl the world's largest free-flying American flag from the George Washington Bridge as a tribute to the World Cup soccer champions. The 450-pound flag is to be flown between 10 a.m. and 2 p.m. Friday as New York City throws a ticker-tape parade for the players. 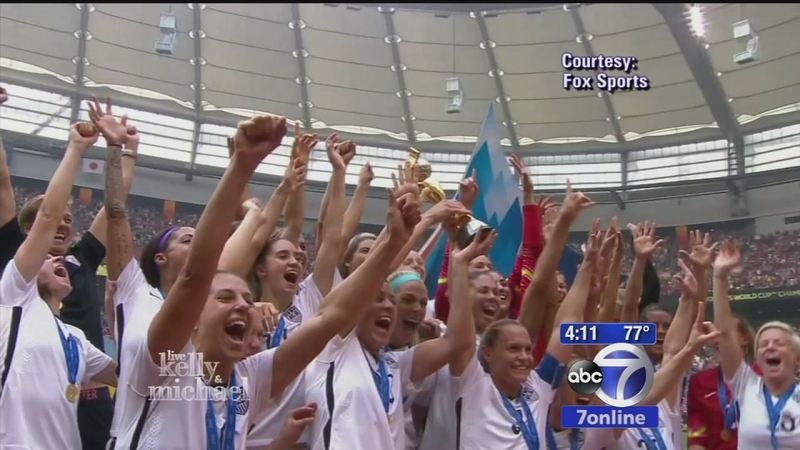 Lauren Glassberg has the latest on preparations for the parade up the Canyon of Heroes for the U.S. women's soccer team. "I think in response to the private sponsorship we feel good that what we need, a half million dollars will be there," said Mayor Bill de Blasio. "I think it will be a great day for the city." And the mayor will be taking part in that parade, riding on a float. But instead of ticker-tape, it will be shredded paper turned into confetti, filling the air and flying from the high-rises that line the Canyon of Heroes. Donated by a company from Brooklyn, nearly 2 tons of it were bagged up Thursday at the Downtown Alliance, then doled out to more than 50 buildings on Broadway. But that's just the 'official' confetti. There's all the other shredded stuff that New Yorkers will throw down onto Broadway on their own. "Well we hope they'll throw paper. It's a good reminder to people. Please throw paper only! We don't want to hurt anybody. We don't want to hurt our heroines or anybody else on the street," said Downtown Alliance president Jessica Lappin. In Clifton, Bond Parade Floats, which has designed floats for decades of ticker tape parades, has been upping the ante as the demand for the number of floats keeps growing. "It started with 8. The next day, went to 10, then they wanted 12 and if they wanted more we'd make it happen," said Robert DeVito of Bond Parade Floats. Extra crews have been out repaving and patching along Broadway, and a stage is going up at City Hall. 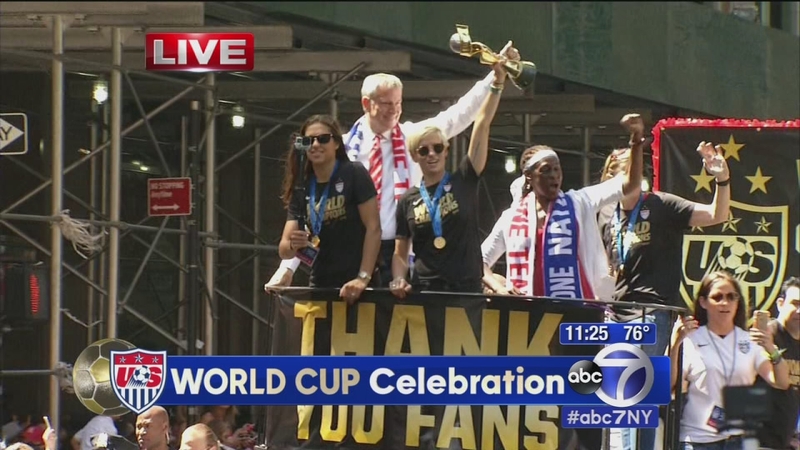 The parade for the United States women's World Cup team will be Friday, starting at 11 a.m.
"Well this is America's team and this parade has honored American heroes going back to the late 19th century," said de Blasio's communications director Phil Walzak. One of the team's stars, Carli Lloyd, appeared on Live with Kelly and Michael Thursday. "The best messages I've been getting are, 'Hey my son is watching the TV, he sees how hard you work, and he's like Mom if I work hard I can be just like her', and to me that's priceless, that's what it's all about," said Lloyd. Security will be noticeable, but not unusually tight. Police already have more security cameras trained on Lower Manhattan and Broadway than any other part of the city. They call this parade, given the timing, no problem at all. "Although this is a relatively spontaneous event in the sense it was only proposed and agreed to in the last couple of days," said Police Commissioner William Bratton. "Fortunately we are just wrapping up the July 4th events so all the resources committed to that are very quickly able to be focused on Friday's event." Taxpayers will foot the bill for most of the parade. A few have complained that the team really isn't connected to the city, but the mayor's people say the expense is well worth it. "So it seems fitting and proper that we put together this event to honor this great team, that has really lifted spirits of people across the country," said Walzak. Manhattan Borough President Gale Brewer had written to de Blasio suggesting the women be honored with a parade in Lower Manhattan. She said a parade sends the right message. "It sends to young women, young women who aspire to be athletes, young women who see very few heroines of this type, that they can be one also," she said. Shellae Versuy's daughters are taking part in the Manhattan Soccer Club summer program, and some of their counselors are high school soccer players: role models in their own right. "Just seeing them on the fields is very inspiring. We would love to be more like them," Ali Peikin of the Manhattan Soccer Club said. And that's how the campers are feeling, too. "They were just talking about it today. It's a big thing for them to see people doing something they love at such a high level," Stephanie Kendler said. "They're really good, and I want to be just like them when I get big," one camper said. In fact, Sunday's victory placed the team in the record books; no other soccer team has won 3 world championships. Among those previously honored with parades have been the New York Yankees when they've won the World Series, and the New York Giants when they've won the Super Bowl. The last female athlete to be honored with a ticker-tape parade was 1960 Olympic figure skating gold medalist Carol Heiss Jenkins. A women's sports team has never been honored with a parade. There have been 205 ticker-tape parades since the first one which marked the Statue of Liberty's 1886 dedication. There have only been 4 since 2000 - two for the Yankees and two for the Giants. The most recent parade was held in February 2012 to honor the Super Bowl Champion NY Giants. Black granite strips are embedded in the sidewalks along the "Canyon of Heroes" with the names of past honorees.